The electronic version of the catalog is now available. Click on the button to view a PDF of the catalog. The two pages for Class Schedule ( pages 56 & 57 ) are very useful in planning out your weekly class schedule. We have a helpful PDF where we have added the page number next to the course title to make it easy to access courses. The page number is where the course is first described. ​You can click on the image to view the 2 page PDF and then print it out. We have another useful index if you are interested in whether a certain instructor is teaching in Fall 2016. Click on the image to view a multi page PDF which list instructors by name, their Course Title, and shows the page number in the catalog where their course is described. ​You can click on the image to view the multi page PDF and then print it out. Is this index useful for you? 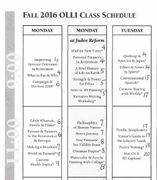 We welcome comments; please email to curriculum@olliatduke.org. The printed catalog was mailed out after July 20th to all members whose address is known to the OLLI Office. Extra copies are in the OLLI Office (in Bishops House) for anyone who needs them. They are also available in local libraries, CCRCs, and other usual locations. ​Share them with your friends and potential OLLI members ... the catalog is a great way to let people understand the learning opportunities we can enjoy in OLLI at Duke. Here are other changes and updates. Page 9, "Current Health Topics" (Course 2111) - the topics for each session can be viewed HERE or on the course website. Page 18, "Living a Moral and Happy Life without God" (Course ID 1218) has been cancelled, due to instructor illness. Page 22-23, "Introduction to Digital Image Editing and Photo Editing with Adobe Lightroom" (Course ID 2030)—the class meets 1:30-4:30, not as listed in the catalog. Page 24, "Hubris. Hollywood, and Helicopters" (Course ID 2100) Correct dates are September 13-November 29, with a cost of $90. Page 27, "FDR" (Course ID 0999) The class will extend to December 7, not November 30th. ​Page 29, "Exploratory Painting with Gouache (Course ID 2050)--section 1 has been cancelled. Page 42, "Trees of the NC Mountains to the Sea Trail" (Course ID 2099) Correct dates are October 6-November 17. This page of the catalog has information on how to register for courses. If you need to register by mail, you can print out a form and fill in for mailing. ​We also have a web page devoted to information about Registration and how to prepare for it. Check out our Registration Tips page.